I grew up with games like Privateer and Tachyon: The Fringe. I've never felt like my game library was quite as complete as when I had some large space game to lose myself it. I had expected to add No Man's Sky to that list, but after the disappointment I suffered at the hands of that game and the lengthy silence from its developers, I've had to move on. I made an appointment at PAX West to meet with some of the developers of Objects in Space, a game I had read about from a Ploygon article back in April. 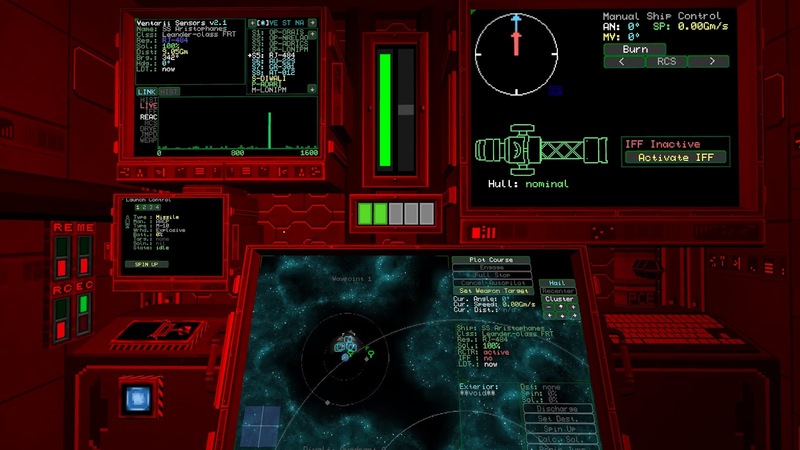 I understood it to be a space sandbox with a really interesting control setup, but when Leigh, part of the team at Flat Earth Games, told me that Objects in Space was like Privateer in many respects, I got really excited. Objects in Space is an experience I won't soon forget. The first thing I saw when I approached the booth was the control setup. This I was prepared for; the monitor in the middle, keyboard below it. To my left and right were an array of switches, lights and indicators. These controls were optional, of course, but using them added a new dimension to the game, reinforcing the immersive aspects. There is something about the tactile response from those buttons and switches that is hard to explain. The best I can say is that it felt authentic. Beyond the control scheme though lies a really intriguing game that reminds me a lot of some of the more involved parts of the X series and Escape Velocity with a dash of Kerbal Space Program. Your main hub area in the game is a series of screens that lay out your navigation, the status of your systems and your actual thrusters and main drives. All of your movement and communication happens on this screen. Unlike really every other space game out there, you don't have a huge, expansive cockpit giving you a spectacular view of the space around you. Your only view of anything outside of your own ship comes from the little radar nav screen. There aren't really any windows to speak of in the ship I piloted, and that felt right. There is a certain claustrophobia in older movies like 2001: A Space Odyssey, and Alien that Objects in Space recreates very well. I've sat in a mockup of the Mercury and Apollo capsules and it was an incredibly tight space. Modern films give us the idea of vast, expansive ships, but the reality of real space travel is very cramped, so I appreciate this approach from Objects in Space. It is incongruous to our initial expectations, but not once during my time with the game did it feel unnecessary or unnatural. Everything fit together just as one would expect from a real, working spacecraft. There is always an urge as a developer to show the player something spectacular. To give them some sight that leaves them speechless. Think of the reveal of Rapture from Bioshock or the first free steps taken in Skyrim. I particularly remember the first time I successfully got a ship into orbit in Kerbal Space Program. It wouldn't be unusual for Objects In Space to do something similar. but they have instead exercised a remarkable calculated restraint. By not showing us the outside, we are left to fill in the void. For me at least, this fairly doubled the potential terror of surviving in that world. It is one thing to not know what lies out there in the vastness of space. It is quite another to be one of those things lying out there and not being able to see what else is out there. By relying solely on the instruments in front of us, we are left to imagine any number of horrors just on the other side of our terrifyingly thin walls. So imagine I did. 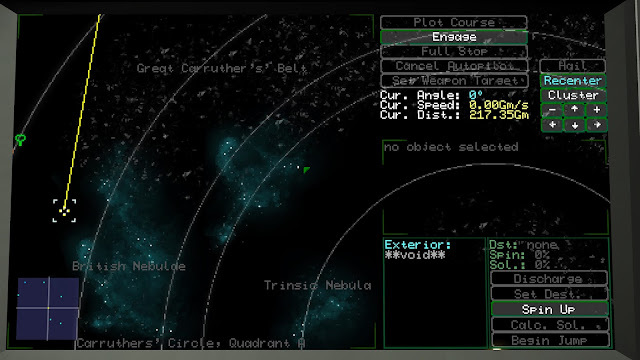 After a brief tutorial of the controls, I plotted a course for a nearby nebula. Once within it, I switched off my IFF. Between that and the interference from the gas clouds, I was effectively hidden from enemy sensors. There I waited for a short time before I picked up a contact on my radar that I was assured was a pirate. I clicked on it, expecting to simply press another button to fire. Instead, I had to prime the missile tube and spin up the missiles I meant to fire. This took time, and every second of it was soaked with tension. I stared back and forth at the screen and the indicator lights. When they finally showed ready to fire, I hit the button and launched two torpedoes at the distant ship. I watched the little icons move slowly towards the target. The trajectory of my missiles took them through the nebula a ways and squarely into the pirate's blind spot, a bit of luck I wish I could claim as intentional. My missiles hit, but didn't knock out the ship. All of a sudden, a flashing red light came on, accompanied by a buzzer. I was informed that this was the master alarm letting me know that it had detected something on a collision course for me. He added, "it's probably a missile." I panicked and plotted a course as far away and as fast as I could get from the spot I was. Another contact pinged on my radar. A second pirate had sneaked up behind me while I had been plotting the demise of the first and had evidently gotten a shot off. I spun the ship round to see how close the warhead was only to find it scarce seconds from impact. My ship shuddered as it hit. My navigation screen buzzed static and blinked off. I was blind. I was guided to the engineering section of my ship and instructed to look at one of the panels. I unscrewed it from the structure and surveyed the damaged panel beneath it. Several components were damaged or destroyed and I set about replacing what I could to get some functionality back. What I managed to get was unstable, but functional enough to get me to safety if I only had enough battery power to get things started. That's about where my demo ended. 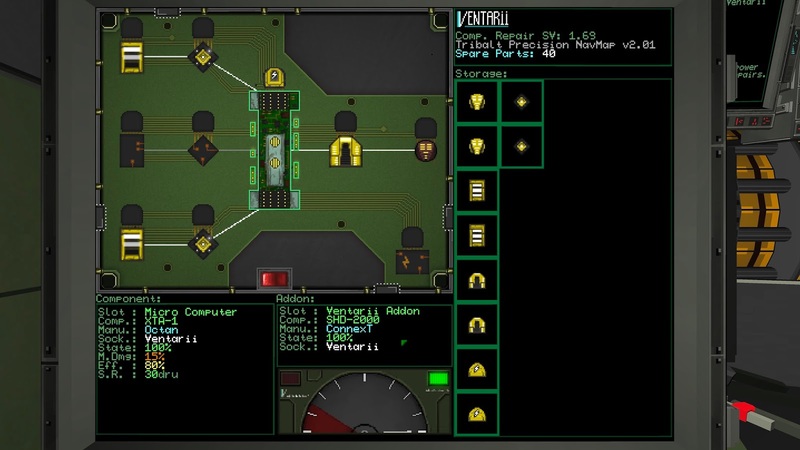 In the full game, players will be able to pilot different ships, modify them for various different roles and make their way in the galaxy doing whatever they feel works best for them; be it as a trader, soldier, mercenary or something in between. When I asked Leigh whether he and the team considered Objects in Space to be a survival game or a sandbox, he quickly assured me that it was a sandbox. He went on to explain that "you have to work hard to actually get your ship destroyed in the game." He went on to say that the pirates in the game are more interested in your cargo, and they won't risk destroying a potential haul. Instead, they will disable the ship (as they did to mine) and pluck the cargo off of it as the player is working to repair the downed systems. "If you end up destroyed by another ship, you've probably done something to deserve that," Leigh said with a grin. Objects in Space was an incredibly enthralling experience. The team at Flat Earth Games has created a world that is simultaneously small and vast, but rich throughout with a tense and exciting atmosphere. When I was finding firing solutions and shutting down transmitters I felt more like I was on a submarine than on a spaceship. It's a very compelling experience, and bot one that is easy to describe. I'm sure I haven't done it justice. If there is one takeaway from this article, it is that you should be following the development of Objects in Space closely. I know I am.